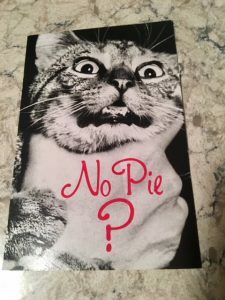 I love pie so much that I keep this post card up on my refrigerator. I make pies for parties. For dinner gatherings. And to bring to people when they are battling illness. I once brought a pie to a New Years’ Eve part. The hostess hollered, “Jess is here–and she brought PIE!” She is a good friend, and well acquainted with my pies. Then he had a slice. We quickly became friends after that. I’ve made spinach quiche for a friend who had breast cancer. She swears my spinach quiche (yes, quiche counts as a savory pie) has healing properties, and was for a few da ys the only food she wanted. Another friend, also battling breast cancer, said almost the same thing about my chicken pot pie. I took a French apple pie to a friend as a house warming gift. She’d moved right before Thanksgiving and served the pie at that dinner, grateful dessert was covered for visiting family. That was two plus years ago. She says her father still talks about that pie. I keep a simple pie journal, in which I note each pie made, date, for whom/occasion, perhaps some thoughts about the person receiving it or the occasion that warrants it, and notes to tweak the recipe. I’m thrilled by these compliments, of course, but my pies are pretty simple, so I’m always a little stunned by the rave reviews they get. But when I think about it, I realize the positive remarks result not just from how my pies taste, but because I’ve given something homemade, one-of-a-kind. When I’d bake with my daughters when they were little, we developed a little ritual–always hug somewhere between mixing up the cookies/pie/muffins and placing the item in the oven. That way, I’d say, some love would bake into the goodies. I think, now that they’re adults, they’ve caught on that the ritual was my way of giving (and getting) a hug. But we still do it, and maybe there’s something to it. 1. A novel can take a year. Or, years. A pie takes about an hour, hour and a half tops. 2. No one has ever rejected one of my pies. I can’t say the same for every novel or story or essay I’ve written. 3. Good writing disturbs, unnerves, or stirs questions–even if, by the end, it resolves. Pie is soothing, comforting. 4. I experience a lot of joy with writing–but also a lot of angst. By comparison, pie making is simple and comforting. My writing and my pie-making aren’t entire separate, though. If I’m stuck on a spot in my writing, I can always take a break and make a pie. There’s always someone who needs a pie! And often, in the rhythm of rolling out dough and stirring up fillings, or having a cup of coffee or tea while the pie bakes, I realize (or think I do!) exactly what I need to do to become unstuck in my writing. And pie ends up playing a part in many pieces that I write, including THE WIDOWS, in which a buttermilk pie plays a role in bringing together the protagonist, Lily, and her husband, Daniel. Pie of the month… but first, a crust recipe! 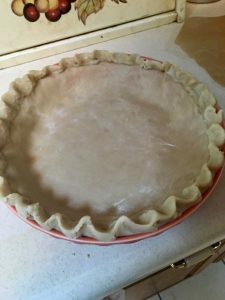 This month, I’ll kick off this blog category with a good basic crust. (I’ll get into other crusts later.) This crust is great for any pie–creme, fruit or savory. I suggest using half-lard/half-butter if you’re making a creme or fruit pie, and half-lard/half-vegetable shortening if you’re making a savory pie. A little less salt for dessert pies; a little more for savory. It’s a very flexible crust! A cheap food scale. (Not strictly necessary, but helpful if you’re using a ratio instead of a recipe. Lard. If you can’t find lard, or are vegetarian, use vegetable shortening. But lard makes a pie crust beautifully flaky. 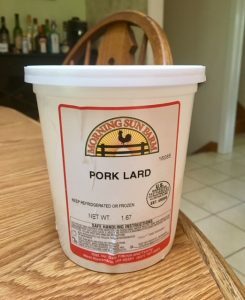 I’d stay away from using all lard, though–that’s a bit too flaky. Butter, unsalted. Definitely do NOT try to use margarine! Plain, or all-purpose, flour. I use King Arthur white flour. The ratio for crust is 3 parts flour, 2 parts lard, 1 part (at least) water. That’s it! So if you want a single crust, that’s 6 ounces flour, 4 ounces lard, 2 ounces water. Making a double crust pie? Double it! Want to make two pies–or freeze some of the pie crust dough for later use? Double again. Want to make a mini pie? Halve it–use 3 ounces flour, 2 ounces lard, 1 ounce water! Measure out 6 ounces flour into a mixing bowl. That was easy! Put in a wee pinch of salt. Stir it in with a fork. Also easy! Plop in 4 ounces of lard/shortening/butter. Super easy! Take your pastry blender and work the lard/shortening/butter into the flour, until the flour is like tiny peas or beads. Now, sprinkle on the ice-cold water. It must be cold. Plop an ice cube in the water if you don’t have refrigerated water–just don’t put the ice cube in the flour/lard mix! Here’s where it gets a little challenging. You have to look at your dough, and see if, as you stir it up with a wooden spoon or plastic spatula, if it’s pulling away from your mixing bowl. Does it look dry? Sprinkle in a little more water until the dough pulls up into a ball. The amount will vary based on humidity, which is why you want to sprinkle in a bit at a time. Think play-do. That’s the consistency you’re aiming for. Once you have a dough ball, flatten it to a thick disc, and wrap in plastic wrap. Refrigerate for at least a half an hour, or up to a day. You can also freeze this dough for later use. When you’re ready to roll out your dough, put one sheet of parchment paper on your counter. Sprinkle with flour. Put your dough disc on the floured paper. Sprinkle on a little more flour. Put on another sheet of parchment paper. You’ve made a dough-parchment paper sandwich! Now, give the sandwich a few good rolls. Lift the parchment paper; sprinkle on a wee bit more flour. Put the parchment paper back on, and flip the whole sandwich over. Lift the parchment paper (that was on the bottom and is now on the top), and sprinkle on a wee bit of flour. Put the parchment paper back on. Give a few good rolls. Repeat the parchment paper lifting/flour sprinkling/parchment paper replacing/flipping process a few times until you have a nice round disc, a bit bigger than the top of your pie plate. After a few attempts, you’ll become a crust-making pro. 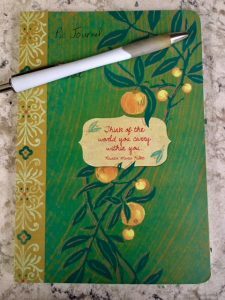 I’m looking forward to sharing my favorite fillings in the months to come! P.S. Do you have crust tips you’d like to share? Crust questions? Visit my Jess Montgomery Facebook Page or Facebook Group and share your comments on the cross-post of this blog post!